This book is almost one of those little gems that you find in unexpected places. Forget the sleaze novel trappings. 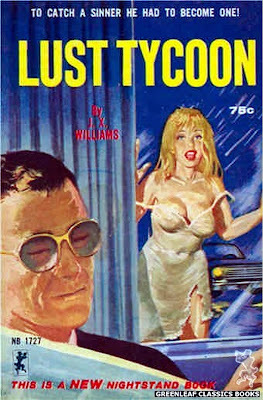 LUST TYCOON is actually a hardboiled mystery yarn that reads more like a Fifties Gold Medal than a Sixties Nightstand Book. The narrator is Tom Dash, a former New York City police detective who retires because he accidentally killed an innocent bystander during a shootout with an armed robber. Dash buys a wrecked ketch, rebuilds and refurbishes it, and charters it for cruises on Long Island Sound. He’s just begun a casual affair with a beautiful young woman who works for him when she’s murdered. Dash isn’t a suspect in her killing, but when he starts investigating her death on his own, two more murders quickly follow, and the cops do think he committed those. So in classic fashion, Dash has to go on the run from the police while trying to find the real killer. There’s nothing in this book you haven’t read a hundred times before, but whoever the real author was behind the J.X. Williams house-name, he tells the story fairly well and keeps the pace crackling right along for most of the book. There are some nice turns of phrase along the way and some decent action. The character of Tom Dash bears a certain resemblance to Lawrence Block’s Matt Scudder and Donald Westlake’s Mitch Tobin, but the writing isn’t that good. I don’t think either Block or Westlake wrote LUST TYCOON, but I wouldn’t be surprised if the actual author was published under other names, too. Reading LUST TYCOON isn’t quite the same as discovering a previously unknown Harry Whittington or Charles Williams or Gil Brewer novel, but it’s pretty entertaining. The plot sort of falls apart at the end, as if the author couldn’t quite figure out how to wrap things up properly. I’m still glad that I read it, and if you happen to run across a copy somewhere, you might consider picking it up. No one has sussed out who wrote this one yet? Nope, not that I'm aware of.